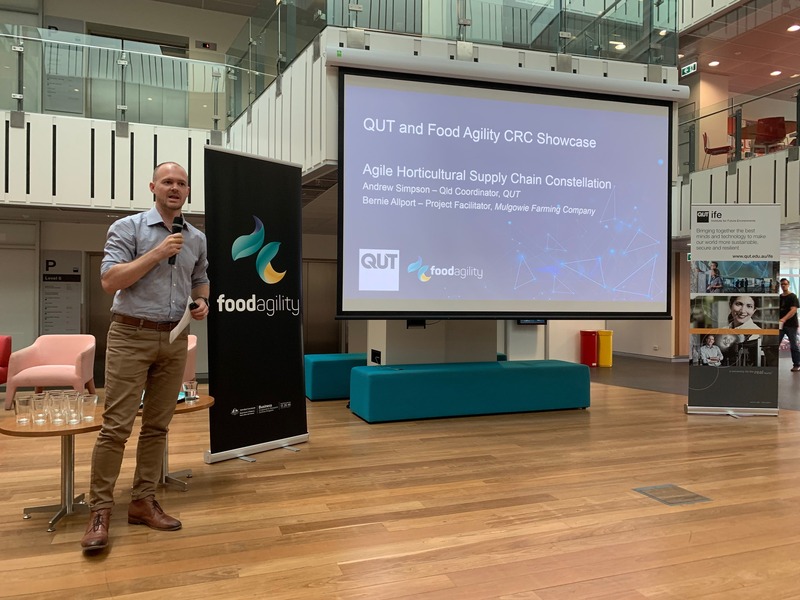 On March 19 our Queensland node, led by Innovation Manager Camilla Roberts and Research Program Leader Prof Roger Hellens, hosted a showcase event for our four QUT-based projects to demonstrate the work they have done so far, and the path towards significant impact for Australian agrifood that they are taking. First to present were Warwick Powell and Prof Marcus Foth, who are using Blockchain, IoT and smart contract technologies to protect Australia's $10.7B beef export industry from the increasing risks of food fraud and substitution. Their work with BeefLedger in the Blockchain for Beef Exports project may be followed via their project page or via the BeefLedger website. They were followed by Dr Carol Richards and Karen Greaves who presented our upcoming project between QUT and Lendlease creating Australia's first digitally enabled sustainable food city. This initiative will pair composting with community food infrastructure and skill development to build circular economy practices into hyper-localised food production - we look forward to sharing more about this project in the near future. Next up was Dr Richi Nayak and the team from our Valuing the Environment in Viticulture project. She described the initial steps that have been taken alongside AWRI and NAB to examine the growing methods and management practices that impact on-farm sustainability in viticulture, and pairing them with a set of production and financial performance metrics which may be modelled to tangibly improve access to finance for ecologically-responsible producers. The impacts of this project may have a profound effect on the way that financial investment risk is measured and applied in the future of Australian agriculture. Closing out the event was Andrew Simpson and Bernie Allport who provided an introduction to our upcoming constellation of projects working towards mapping the key data and decision points of horticultural supply chains. The partnerships formed in this space will form important proof of concepts for the role of digital in modern food value chains, and we look forward to sharing more with you soon. A big thank you to all who participated and for our friends at QUT for putting on the event. We look forward to holding similar showcases around the country in the future as we continue to develop #FoodfortheFuture.